The bowl that I glazed with Scout last week came out of the kiln today. As anticipated, it doesn’t look at all like I had imagined it would. 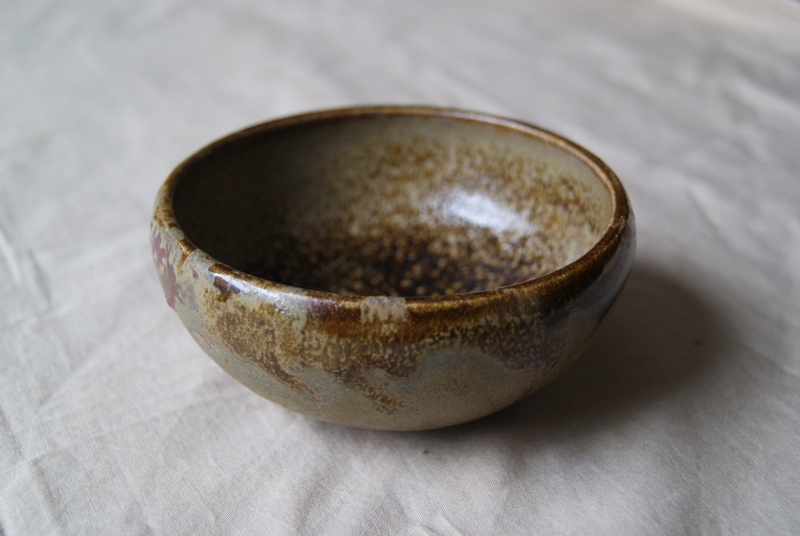 I had thought that the body of the bowl would be a much darker, richer brown, approaching black in places, and then for there to be a pink/blue ring around the foot. The pink/blue ring is there but the darker brown is only there in flashes. 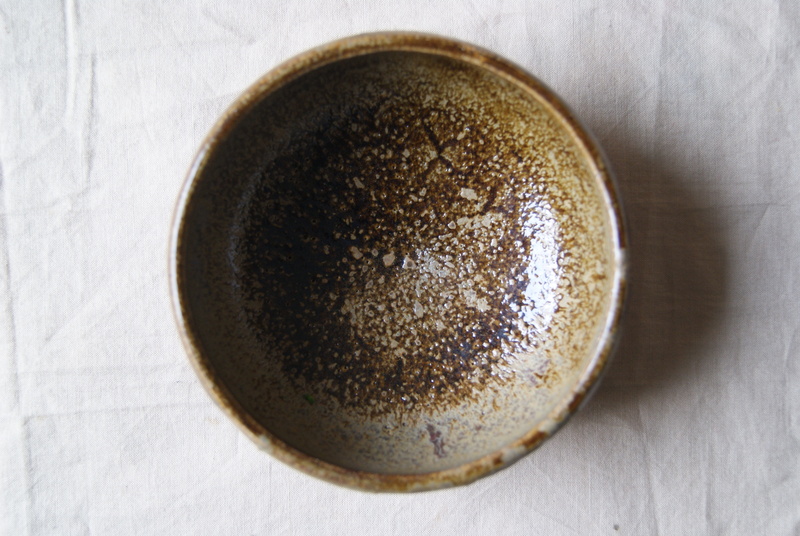 The hollow of the bowl looks like it is encrusted with burnt sugar and the over-riding colour is what one might call ‘Studio Pottery brown’. It’s the colour that I associate with more traditional studio pottery: serious and worthy, a bit like having too many green lentils. It’s fine but not very exciting. Having said that, I love this little bowl. I didn’t at first but the more I look at it the more I appreciate it. I am fascinated by the juxtaposition of colours that fill the sky and how they are affected by the seasons, the cloud formations, the time of day, the addition of the landscape. The array of greys on a winter’s day against the mute, desaturated green of a darkened landscape. Rose madder against phthalo blue. The palest yellow shut in, squeezed about the edges, by a vast charcoal grey. 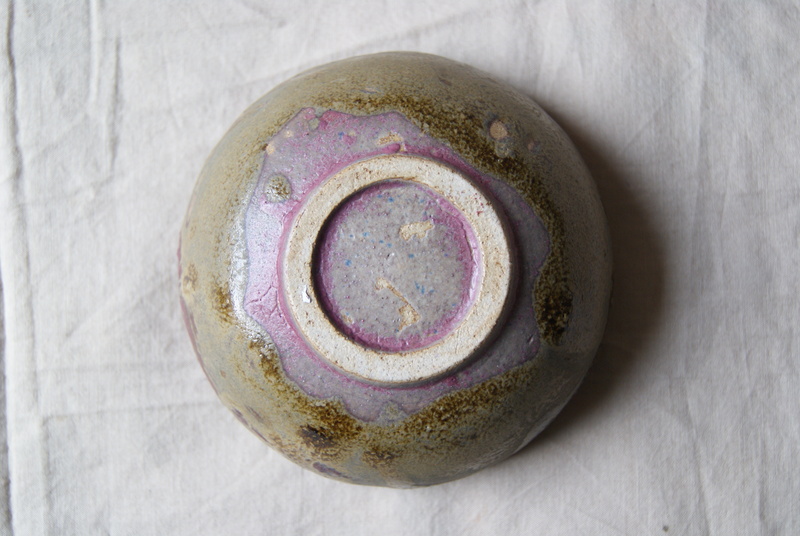 I want these colours to be an inspiration with regards to glazing and I can see with the overlay of the tenmoku over the pink/blue glaze how this might be possible. The pink/blue glaze is revealed by the tenmoku almost like the parting of a cloud revealing the sunset. It’s not there, obviously, but I can see how it might be. These colours don’t appeal to me but I do like the combination of a brighter hue alongside something more sober and understated. I like the layering and depth created by the thick application of the glaze. I like the unpredictable nature of the surface and the texture that results. It’s the first object I’ve kept since I started using the wheel and now I am keen to experiment more with glazes and make more pots upon which I can experiment. You are currently reading Glaze at The Hopeful Potter.